Weather Watcher 1.1.8 was just submitted to Apple. Here is the list of changes plus a sneak peak screenshot. 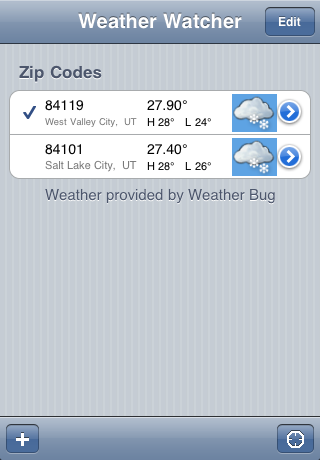 Added ability to set zip by current location – Now tap the locate button and quickly select the zip you’re currently at. Server update: Added the ability to display 0 and below temperatures by using 1,000 for 0, 1,001 for -1, etc.